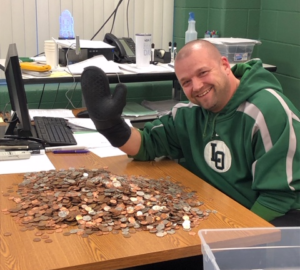 LOHS teacher Kevin Crowther used an oven mit to count the change students brought to his class. 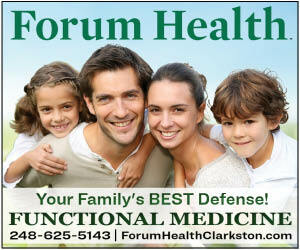 Photo provided by LOCS. On March 29, Lake Orion High School’s Leadership class received their grand total of money raised during Charity Week. Charity Week began with the Special Olympics basketball game on March 15 and continued through March 22 with a number of activities designed to encourage students to donate to the cause. The greatest amount of donations came from coin stalls held on March 19 in student’s first hour classes. Students were encouraged to bring their first hour teacher change that the teacher would have to fully count before the day’s lesson would begin.